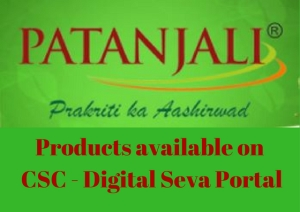 Patanjali will soon be able to sell their products their CSC -Digital Seva Portal via 250000 Common Service Centres spread across the country, Everybody know Patanjali is one of the Major fast-moving consumer goods (FMCG) Player, Its really Very good News for Vle's for earn handsome amount through Patanjali Products.With the demand for FMCG products in villages increasing, it was decided to use the vast network of CSCs to sell these products. People in villages can come to Common Service Centres and purchase these products and get the products delivered. The government is focused on the expansion of CSCs because it can transform rural India. CSC SPV has opened doors for popularizing e-commerce through CSCs,” VLEs would have great opportunity to earn handsome amount of margin through selling of FMCG products. VLE would earn a commission in the range of 5 to 50% (approx.) on selling of FMCG products.VLEs would be able to order products through Digital Seva Portal under “CSC Goods” category. The Patanjali Ayurved Limited is an Indian FMCG company. Manufacturing units and headquarters are located in the industrial area of Haridwar while the registered office is located at Delhi. founded as a small pharmacy in Haridwar in 1997 by P.P. Swami Ramdev Ji Maharaj.Acharya Balkrishna is the Chairman of Patanjali Ayurved Limited and Mr Sh Rambharat is the Sr. Vice President of Patanjali Ayurved Limited.The company manufactures mineral and herbal products.produces quality Herbomineral preparations. To monitor quality, the Divya Yog Mandir Trust and Patanjali Yog Peeth grow many endangered herbs on its farmland. The principles of Good Manufacturing Practices (GMP) are rigorously followed in the plant and Company prides itself on being environment friendly.It also has manufacturing units in Nepal under the trademark Nepal Gramudhyog and imports majority of herbs in India.According to the report, Patanjali is one of the fastest growing FMCG brands in India with an estimated turnover of over Rs. 5,000 crore in the financial year 2015-16. This figure is expected to double by 2017.